Whether you are the first one out in the morning or the last one to feel the days warmth in the sand, there is nothing quite like the experience of the lights of heaven as they rise above the vast ocean. There is a brief moment in time where the moon and sun look larger than usual, the colors are dazzling, and the soft breeze stirs the water so the shimmering reflection of the light dances across the water in a mesmerizing display. 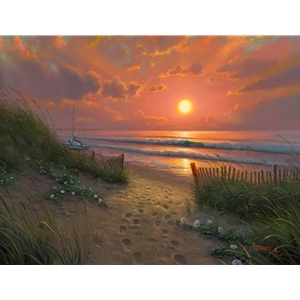 Mark Keathley has captured this moment in time as a gift to so you can be awed again and again by the light. "This is one of my favorite experiences in life - a light show put on just for me by my Father."